A cycling program is a great way to get in good shape and to lose that excess weight. Even a short bike ride such as three miles burns a surprising number of calories. For best results, you should maintain a continuous effort, rather than stopping and starting when doing so isn't necessary for safety reasons. Continuous effort maximizes the cardiovascular and calorie burning effects of riding a bike. The Cleveland Clinic describes biking as aerobic exercise, which means you maintain a sustained physical effort for an extended period of time – at least several minutes. For exercise and calorie burning, you may use a stationary, road or mountain bike. Bike riding is a good choice for people with orthopedic or arthritic problems and for those over age 50. Biking places less stress on hips, back and legs than aerobic exercises like running. The number of calories you burn cycling depends first on how far you ride. However, your weight plays an important role as well. A large person uses significantly more calories to cover the same distance compared to a small individual. Your speed also affects how many calories per mile you use. The type of bike riding you choose influences the number of calories you burn. Riding a mountain bike on unpaved trails uses more calories than road biking. Use can use a calorie calculator to keep track of your exercise expenditure. You must know your time as well as distance covered to estimate how many calories you burn riding a bike three miles. Use your time and distance to figure your average speed. To calculate average speed, divide the distance covered by your time in minutes and multiply by 60. For example, if you ride three miles in 15 minutes, use this formula: 3/15 x 60 = 12 mph. Next, look on a chart of calories burned over time such as those provided by Harvard Health Publications or NutriStrategy.com to estimate calories burned. These charts usually list calories burned for half an hour or full a full hour. To find the calories burned for other amounts of time, multiply the calories-burned estimate for your weight and speed by your time in minutes divided by 60. Suppose you ride a road bike for 15 minutes at 12 mph -- three miles -- and you weigh 155 lbs. You will burn 596 calories multiplied by 15/60, or about 149 calories. 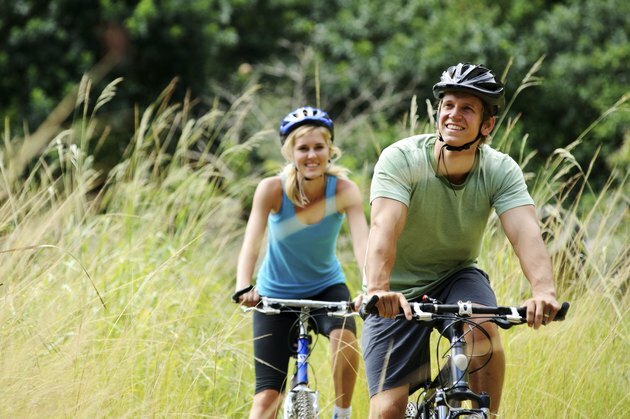 A three mile bike ride isn't a lot of exercise, especially if you are trying to lose weight. It takes about 3,500 calories to lose 1 lb. To maintain a good level of physical fitness, you need to get in at least 150 minutes of riding or other aerobic exercise each week. The Cleveland Clinic suggests a 30- to 60-minute ride three to five times per week. For example, if you weigh 155 lbs. and ride 150 minutes each week at 12 to 13.9 miles per hour, you will burn about 472 calories an hour, for a total of about 1,180 calories. That's equivalent to about one-third of a pound. Of course, you can ride farther and faster as you build up your level of physical fitness, so you can burn calories faster if you wish. How Long Should a Jog Last?